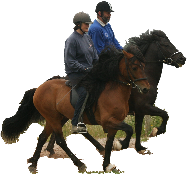 Our policy is to try to match riders to horses and we will not knowingly sell anyone an unsuitable horse. To that end we encourage would-be purchasers to spend time here trying horses before they buy. We can organize individual courses to cover riding as well as management of Icelandic horses so that new owners can be as well informed as possible before taking their new horse home. Due to insurance problems we do not allow horses to go on loan prior to purchase however we aim to give new owners as much support as possible in settling their new horse into their home or in the future training of the horse. We offer a full training and backup service for horses and riders. This page contains a selection of the horses that are currently available. All of the homebred horses have been correctly wormed and fed since birth and we can provide details of the worming regime for each horse, giving you confidence that the horse you buy should not die early due to incorrect or incomplete worming during the early years. We back the horses at four and give them a basic training in stop, start and steer. This includes training the horses to respond correctly to a bit in their mouths. As with many other trainers we initially train the horses to respond to a headcollar or halter when they are first ridden. However we then progress to riding with a bit in their mouths. We do not believe that the horse's education as a riding horse is complete until their mouths have been trained to respond confidently to light pressure from a snaffle bit. The horses are trained and developed using the principles of classical training, including Equine Learning Theory and the principles of Classical and Operant Conditioning. This means that particular attention is paid to the development of their topline and carrying abilities, while also ensuring that the horses truly understand and develop the expected response to the rider’s cues - or aids. This takes time and we are committed to taking the time to ensure that each horse is not forced into false outline but helped to build up its musculature and balance in the correct way. It takes two years to produce a well-mannered and confident riding horse with a good basic training. After that, any specialist training may begin. 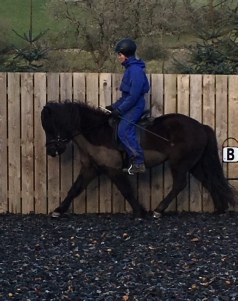 In the interest of both the horse and rider, we will only sell horses under 5 years to experienced owners who have had prior experience of bringing on young horses. If you are interested in younger horses please phone to discuss what might suit you. Already sold: Grettir frá Lækjamot is the sire of Fylkir, Janke, Lyskra and Farsaell. Grettir is now in Germany but we are currently working with his offspring and they are proving to be very rewarding. 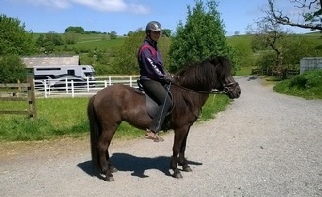 We have a selection of younger horses that can be made available to experienced homes. Please phone 015396 24000 for further details. We also have a few older horses who are looking for permanent, loving homes with light but regular work. If you think you can offer such a home to an older horse please ring for a chat. 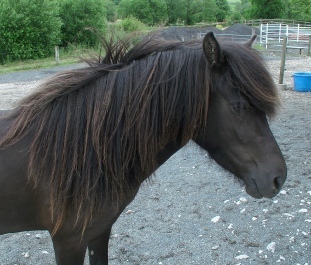 Maekja is a black mare with no white markings. She is feisty and opinionated but is obedient in spite of herself. She has very long and strong trot and lovely ground-covering walk. Her canter is comfortable and correct and her tolt is developing well. She is riding out on her own as well as in company. She will be a lovely partner for a discerning rider.